For the second time in a week, the Guardian has whitewashed the extremism of a ‘pro-Palestinian’ group. Last week we highlighted a Guardian story focusing on last week’s al-Quds Day demo in London that didn’t even mention the pro-terror extremist rhetoric (including antisemitism) at the march. The article benignly referred to al-Quds Day as ‘pro-Palestinian’. The latest example involves an article (Palestinian event in London faces ban over Hamas links, June 25th) written by Ewen MacAskill, the Guardian’s defence and intelligence correspondent. One of the biggest Palestinian events in Europe scheduled to start in less than a fortnight is in doubt after intervention by the British government. Palestinian Expo, which includes political discussions, concerts, comedy acts, workshops, a food court and other events, is scheduled to run at the QE2 centre in London on the weekend of 8 and 9 July. The organisers are expecting the event to attract about 10,000 people. But the Department for Communities and Local Government, which is responsible for the QE2 Centre, wrote to the organisers on 14 June saying the secretary of state, Sajid Javid, was minded to terminate the contract. The letter cited “concerns that your organisation and those connected with it have expressed public support for a proscribed organisation, namely Hamas, and that you have supported events at which Hamas and Hizballah – also proscribed – have been praised”. The organisers, Friends of Al-Aqsa, wrote to the department complaining about the proposed ban. The department promised a decision by Friday. But on Friday, with just a fortnight to the opening, the department expressed regret that a decision had not yet been made, saying Javid had been busy with other recent events, an apparent reference to the Grenfell Tower disaster. Ismail Patel, founder of Friends of Al-Aqsa, said the department was unlawfully interfering in the event. “They have failed to provide any satisfactory reason as to why they have chosen to cancel an event which seeks to celebrate Palestinian culture and heritage,” he said. He accused the department of acting on hearsay from a pro-Israeli lobby group. What the Guardian journalist fails to tell you is that the government isn’t acting on “hearsay from a pro-Israeli group”, but a plethora of evidence demonstrating the extremism of Ismail Patel and Friends of Al-Aqsa, the group he founded in 1997. FOA was involved with an effort to bring antisemitic extremist Raed Salah to Britain in 2011. FOA has has published articles by Holocaust Denier Paul Eisen; Gilad Atzmon, who claims “Hitler might have been right after all”; and Israel Shamir, who’s claimed that Jews “ritually murdered Christian children for their blood” and that Jews are aligned with demonic forces. Patel was previously spokesman for the British Muslim Initiative (BMI), a group whose officials included Hamas operative Mohammed Sawalha. Patel took part in a ‘Convoy to Gaza’ organised by activists in the West to bolster support for Hamas. 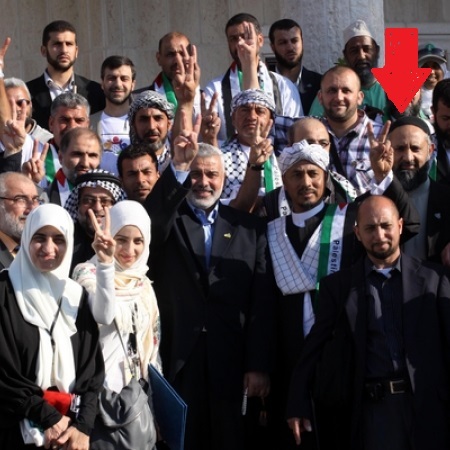 Patel was a passenger on the Mavi Marmara ship, part of the 2010 flotilla organised by a group (IHH) with terrorist links. Patel has expressed support for the late French Holocaust Denier Roger Garaudy. Also, Patel previously was an op-ed contributor at the Guardian. MacAskill’s failure to challenge Patel’s claim that the government was “acting on hearsay from a pro-Israeli lobby group” is classic Guardian: failing to reveal well-documented evidence demonstrating that individuals and groups they cover – who claim to be merely ‘pro-Palestinian’ – are compromised by extremism and antisemitism. Guardian op-ed argues that BDS, the campaign to silence millions of Israelis, is pro-free speech. Interesting that the article in The Guardian cesspool is not ‘comment-enabled’. It almost seems as if the Guardian is quite simply terrified of the rational commenters there who are turning up in increasing numbers and … ‘spoiling it’. Can’t wait until ‘pressing financial losses’ bring an end to this purveyor of filth which used to be a news paper of the rational ‘left’. We have looked the other way since 1948 while the Palestinian leaders have encouraged and rewarded the killings. .This racket can’t be stopped without the street turning violent. A gradually diminishing payments may be agreed upon and a member of the family would be considered for a training program to taper off the terrorist reward income.